The valedictorian for the 2002 class at Fieldcrest High School is Daina Wells. She was on the National Honor Society, the French Honor Society and the Illinois State Student Council. 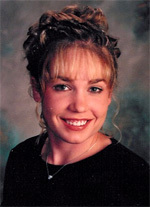 She was area golfer of the year in 2000 and 2001. She also participated in basketball, track, and softball. She was on the first team of the All Midstate Conference softball team and was honorable mention on the All Midstate Conference basketball team. She was on the yearbook staff and had a perfect attendance for 4 years. Daina received a $32,000 Trustee Scholarship from Butler University in Indianapolis, IN where she was chosen to be one of 150 accepted into a seven year Doctor of Pharmacy program. She is the daughter of Terry and Nancy Keith of rural Minonk and the late Dale Wells. 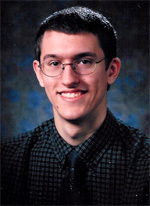 Francis Turner is the salutatorian for the 2002 class at Fieldcrest High School. He participated in the Scholastic Bowl for 3 years and was in AFS for 1 year. He was on the National Spanish Honor Society for 1 year and the Academic Challenge Team for 3 years and was a National Merit Scholar. He was honorable mention on the All Area Academics published by the LaSalle News-Tribune. Francis will be attending Illinois Wesleyan University where he will be majoring in physics. He is the son of Robert and Nancy Turner of Minonk. Betty Buss of the Minonk Garden Club said that vandals broke tree branches off and crushed some bushes in the downtown city park. The park is on Chestnut south of Fifth Street and has been maintained by the Garden Club since the 1970's. Buss said that the damage occured after 10:00 p.m on the first day after school was out. Buss said that kids have also written graffiti on the benches in the park. She asked the council to consider putting in a 10:00 p.m curfew in the park for kids. Alderman Ron Redenius agreed that something should be done. He said that he has received comments from people remarking on how nicely the downtown area is landscaped. Public Works Supervisor advised that it is not fair to punish all kids because of damage done by only a few "bad apples". Mayor Spencer said he will confer with the police department to see what can be done to remedy the situation. In a related matter, alderman Sherry Stalter said that vandals also broke into the restrooms at Veterans Park last week. She said that this was the first incidence of vandalism in two years. Fieldcrest players Ryne Haag pitched 2 scoreless innings and Drew Glowacki had a 2 run triple to help the Pantagraph Area All-Stars defeat the Intercity All-Stars in the annual Pantagraph High School All-Star Baseball Game Sunday afternoon at O'Neil Park in Bloomington. Fieldcrest ends the season with a 17-9 record. Midstate Conference first team: Pitcher Ryne Haag, left field Kyle Lutz, catcher-pitcher Drew Glowacki, first baseman Eric Heider. The roof of the old Masonic Temple building collapsed late Sunday afternoon. Walnut Street has been closed to traffic because of fear that the walls of the building might collapse as well. The structure, located at the corner of Sixth and Walnut, had been unoccuppied for many years and was in a state of disrepair. The building has been neglected for many years and was becoming an eyesore to the neighborhood because of the accumulation of junk that was standing on the property. The owner of the building is Cheryl Clark of Minonk who is believed to be living in Florida at the present. The building was built in 1891 as the Dasher Hotel and has been a landmark in Minonk. Later the building became the headquarters for the local Rob Morris Masonic Lodge until the early 1970's. It was then sold to Ken VonBehren who eventually sold it to Clark. The building had been used primarily as a storage facility since then. It is not known what will be done with the building at the present. However, it appears that another Minonk landmark will again fall victim to neglect and abuse. The Woodford County Junior American Legion baseball team has 3 boys from Minonk. They are Brett Brown, Josh Gerdes and Geoff Reiter. The team is made up of boys from schools in Woodford County (Fieldcrest, El Paso, Eureka, Metamora and Roanoke-Benson). All home games are played in Metamora. The team is coached by Eric Stone and Mike McKay. The team played Creve Coeur Wednesday at O'Brien Field in Peoria (home of the Chiefs). Woodford County won 10 - 3. Brett Brown was the winning pitcher and also hit a home run out of the park. The team is now 2 and 1 on the season. Donny Marshall won a new Harley Davidson Low Rider Saturday in Peoria. It was given away by WWCT, 106 radio station and several other sponsors. He and 250 other people were 6th callers to get a chance to win the motorcycle. Donny and his dad, Glen, picked up the bike this week. The MCHS Class of l949 met at the Woodford in Minonk for their 53rd class reunion. Thirty seven classmembers, spouses and guests attended. Class members present were Glenn Janssen, Jim Curley, George Kapraun, Don Cremer, Don Newton, Jim Thompson, Kenneth Froman, Betty(Schmidt)Wheatly, Clara(Rients)Spencer, Mary(Petri)Ford, Carolyn(Ioerger)Welch, Merlon Dornbush, Ed Kapraun, Jane(Luedtke)Seiler, Delmar Cunningham, Cliff Bachman, Robert Rients, Ken McCormick, Lavada(Schook)Cook, Betty (Gutherz)Uphoff, Joanne(Cline)Meierhofer and Margaret(Bryson)McGill. Guests traveled from Cornell, Normal, Washington, Elmhurst, Rutland, Winnebago, Benson, Metamora, Chanpaign, Flanagan,El Paso, Washburn & Decatur. Two class members from out of state attended, Glenn Janssen from Iowa and Don Newton from California. Ten classmembers are deceased. Heavy rains hit the Minonk area Wednesday night and early Thursday morning. Areas of the city received up to 4.5 inches of rain while the rural areas received over 3 inches. There were reports of up to 6 inches of rain in areas between Minonk and Pontiac. The storm was accompanied by an extreme amount of lightning. A tree was struck by lightning in front of the house of Ned Leiken on Maple Avenue causing the tree to split and fall luckily away from the house and from the power lines. There was also flooding of fields in the area. For more pictures of the rain storm, click here.